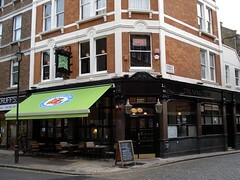 Pub in Fitzrovia, refurbished in late 2007 and now offering a range of real ciders and perries. It's part of the Mitchells & Butlers Castle sub-chain. The decor inside is a bit Soho, but quite comfortable photo; the downstairs part has lots of leather banquettes and dark wood, with a booth down behind the bar (sometimes booked on busy evenings) and a few tables outside during summer. There is a separate room upstairs which is occasionally booked out for functions or events. The music is generally pretty interesting, though often a bit loud, particularly at peak times. The drink options are clearly focused on cider, of which they have a large selection, including several from cask boxes behind the bar, and Addlestone's cloudy (£3.10/pint as of May 2009). They also have Applebocq apple-flavoured wheat beer, and several fine lagers including Sierra Nevada (£3.80/pint) and Staropramen. There are three handpulls for real ale, but ales aren't brilliantly kept, or even always available (Firedrake found they had no ale on at all on a April 2008 visit, and no idea of when they might get them back). In November 2007, Kat's Doom Bar was rather sour, while in January 2009 Ewan's London Pride was particularly bad (though as the beer was off shortly after, it may have been the dregs of the cask). The pavement can get packed on busy evenings, and one of the bar staff had to continually ask people to move onto the pavement on a May 2008 visit. Food is served. In November 2007, Kake's macaroni cheese (£6) was a bit bland, without much cheese flavour, and somewhat underseasoned, but it was served nice and hot and the pasta wasn't overcooked. I didn't think it was at all stodgy (though Sarah tried some of mine and thought it was overly floury). It was served as a decent-sized individual casserole dish full, with no unnecessary bits and pieces on the side. In November 2008, Ewan's vegetarian burger was decent, if a little dry, and chips were a little undercooked. However, a friend's nachos were quite excellent. Last visited by Kake, Kat, James, Her Welshness, and Ewan, 6 May 2009. Opening hours taken from website, March 2009. Last edited 2013-06-06 12:36:05 (version 21; diff). List all versions. Page last edited 2013-06-06 12:36:05 (version 21).